Manufacturers of do-it-yourself “smart” devices often claim that having a smart home is as simple connecting a few gadgets like light bulbs and electronic door locks. But as any custom install pro will tell you, smart homes aren’t that simple. You can’t “leave it to the homeowner to figure out” that a true smart home requires devices that interact within a thoughtfully engineered automation system. It’s going to cost more up front, but the long-term return on the investment—including reliability, functionality, serviceability, expandability, and client support—will be much greater than any DIY system can provide. To help you educate your clients, here are seven features every homeowner needs in a smart home today—and why they need them. The first thing a homeowner needs to do is pick a platform upon which a whole-home automation system can be built, eliminating the possibility of getting lost at sea amid the Islands of Things. A smart home “platform” is much like a smartphone and its operating system: it’s the basic hardware and OS that makes it possible for everything else to function seamlessly. In order for the platform to work reliably and effectively, though, the home must include a robust network infrastructure with wall-to-wall coverage—and possibly Wi-Fi connectivity in select outdoor areas. Even the best hardware and software is useless if the components can’t communicate reliably. One of the most popular smart home features is home security. There are four parts to the security of a smart home, Lautner explains. The first—site access—includes the ability to monitor and control access to the home through entry points such as exterior doors and garage doors. The second—perimeter access—involves automation and control of access to property gates and driveways. The third—video surveillance—offers immediate (or recorded for later reference) views of activities occurring outside and inside the home. The fourth—individual sensors—is a collection of traditional alarm triggering devices, such as motion and contact sensors. Many homeowners don’t know that energy management can include much more than a smart thermostat. “A benefit of integrated ceiling fans is that the system can start a fan prior to turning on the air conditioner or heater. The fan will cool a room by about 3 degrees prior to cooling, and can push warm air down prior to heating. Shades and other automated window treatments can help heat or cool a home, reducing energy costs. Many automation platforms can manage a home’s solar system as well. As a safety issue, systems including integrated smoke detectors can be programmed to automatically turn off the HVAC system’s blower and stop the ceiling fans in order to keep smoke—and possibly fire—from spreading. Lighting control is an essential feature in any smart home, but it goes beyond turning bulbs and fixtures on and off. “Lighting includes shades so you can control natural and artificial light together … and enhance ambiance for entertaining or watching movies. Controlling two dramatically different things—natural sunlight and artificial electric light—as one seamless entity is the epitome of what a smart home should be. Light and shade control can also provide an element of security by ensuring you’ll always come home to a well-lit house, have lights turn on automatically when doors are opened at night, and operate on a random or set schedule to make a home look occupied when the owners are away. Whole-house audio is a feature that’s difficult for DIY systems to handle well—if at all. Music throughout the home is an area where integrators excel, but we advise that you make sure the home’s audio system speakers also integrate with intercom and security alerts so homeowners may enjoy the full benefit of audio distribution in a smart home. “One remote, one button-press TV control” is another specialty for custom integrators, but there are additional benefits to routing video within a smart home on a single, powerful platform. Giving customers the ability to use their TV to monitor their surveillance cameras—whether pointed at a doorbell, a driveway gate, or in the baby’s nursery room—is a tremendous comfort and convenience. An entire blog post could be dedicated to what you can do outside the walls of a smart house, but let’s keeps it simple for now. “Smart outdoors includes extending the control of low-voltage lighting, music, and outdoor surveillance, as well as incorporating automation of the pool and irrigation systems.” Whether or not the homeowner intends to expand the smart home elements outside the house, it’s a good idea to plan for an outdoor network access point. As these seven essential items of a smart home suggest, a true smart home is more than a compilation of connected devices. It encompasses many of the features described herein one simple-to-use package that reflects and serves the homeowners’ lifestyle. Is their home intended to be a weekend refuge or party central? The level of customization and service you provide your customers cannot come pre-packaged in a store. It can only come from the attention you provide your clients with your services and true smart home automation. Internet, Modem, Router…what’s the difference? We’ve all heard about the terms modem, router and internet, but unless you’re very tech savvy, you might find it hard sometimes to differentiate between those. And yet, they are the main components to any smart home network. Did you know that these might be included in the same device, they may be separate or you can have multiple of each? Let us try to explain what your home network consists of, and how to get the most of each part. The modem is the device that connects the outside world internet with your home. It basically converts the signals that can travel large distances to a form of signal that your internet service provider (ISP) can understand. Your modem can use coaxial cable, fibre optics or a phone line to transfer that data and the basic difference between those is the speed they can carry data − fibre optic system can carry up to 10 giga, or billion, bits per second, whereas coaxial cable is limited to only 50 mega, or million, bits per second. If you have a choice about your modem you need to make sure it will work with your internet provider. You should talk to your ISP about what standards they support, and what maximum speeds you can use on your account. Keep in mind that in the future your ISP may allow faster speeds so it might be wise to get a modem that can run faster than you need now to plan for a future upgrade. Unless you plan to have multiple internet connections to your home you probably want to get a modem that includes a router. This device is usually inside your modem and is the one responsible for connecting all your smart devices in your home. It allows different networks to communicate with each other and the internet. The main choice about which router to use comes down to speed. You will want a router that can handle the same speed as your internet connection at least. If you have lots of device to device traffic on your home network then you will need a router that can handle traffic of that speed also. An access point will allow a wireless networking (also known as Wi-Fi) device to connect to your wired network (usually your modem and router). Wireless standards run on two different wifi bands, 2.4GHz and 5GHz. Keep in mind that most Wi-Fi systems allow you to access these two, so even if you’re used to the 5GHz band, you will most certainly be able to find the 2.4GHz band under your Wi-Fi list on your phone. If you’ve got a small to medium home, you will have enough with a single access point and, if you have never heard about access point before, it’s probably because it’s built into your router (and you don’t need to worry about it). 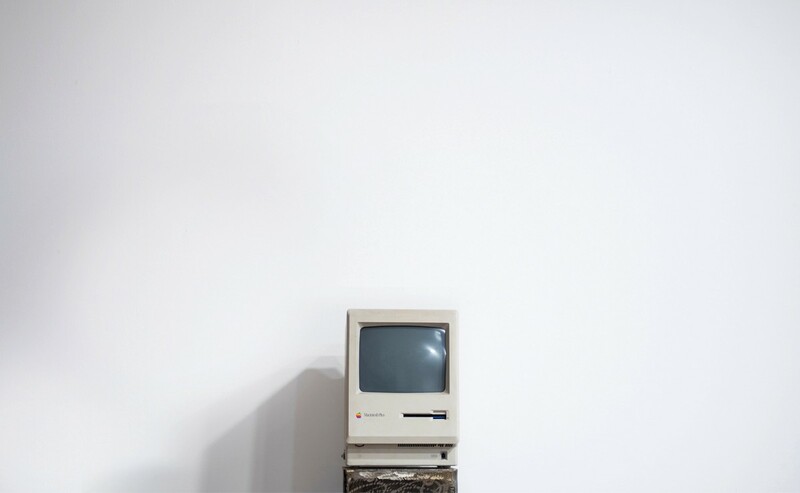 However, if your home has multiple floors, a large floor space or more than 20 devices, you might already have considered installing more than one access point. https://smaart.house/wp-content/uploads/2017/09/smaart-house-logo.original-300x75.png 0 0 Bijou Lulla https://smaart.house/wp-content/uploads/2017/09/smaart-house-logo.original-300x75.png Bijou Lulla2018-06-03 00:49:202018-06-03 00:49:20Internet, Modem, Router…what’s the difference? The ride-hailing company Thursday announced the launch of Uber Health, a desktop platform for healthcare providers that allows doctors to provide rides for patients who might otherwise miss their appointments because they can’t get to them. Uber Health has been in testing since July with around 100 physicians and hospitals. Rival Lyft also has been working with healthcare providers over the past few years. Both tech startups have been looking for ways to grow their business with companies. The benefits to doctors and hospitals of using ride-hailing apps — which replace taxis and medical shuttles, but not ambulances — include on-demand scheduling, destination tracking, and lower costs, said one doctor who had tried Uber’s service. Nationally, missed appointments cost healthcare providers $150 billion a year, with no-show rates as high as 30%, according to SCI Solutions, which provides IT services to the healthcare industry. “In the past, we used taxis, but you had to hand out a voucher in person, you had no idea where the person might be going and it cost 20% to 40% more,” says Chris Needham, director of Member Health and Wellness at Renown Health, which serves urban and rural patients in northern Nevada and has been testing Uber Health since October. Needham says hospital staff assesses which patients are at risk of missing critical appointments and provides them with pick-up and drop-off rides at the hospital’s expense. Another benefit of the service is helping healthcare providers meet patient care goals that can factor into how a facility scores with regulators. Critically, Uber says it’s worked with Clearwater Compliance to ensure Uber Health is compliant with HIPAA (Health Insurance Portability and Accountability Act) standards. More than 100 healthcare organizations have been using Uber Health as part of its beta program, including Blood Centers of the Pacific, Georgetown Home Care, LifeBridge Health, and MedStar Health. The dashboard and API are now available publicly. Microsoft has a new app out today called Soundscape that uses 3D audio technology to help map out landmarks and points of interest through audio cues. Soundscape empowers more people to explore the world around them through a 3D audio experience. The app enriches your perception of surroundings as you walk, helping you get where you want to go. Rushing between classes, going for coffee with a friend or touring a new city with the family are all common experiences that could be more rewarding and cause less anxiety for nearly 300 million people with sight loss worldwide. Users can set audio beacons at specific destinations and places, and the app will provide 3D audio cues (which can be perceived directionally) to help improve their “ambient awareness” as they travel there. Users will then be able to incorporate that information from the Soundscape as they build a mental image of what’s around them. The Soundscape app can also call out points of interest, roads, and intersections that you pass, along with more specific settings for describing a user’s current location and direction, or what’s coming up ahead of them. For example, it can describe different shops and street names as you walk by, something that other navigation techniques used by people with visual impairments can’t always help with. If a user isn’t sure where they are or which way to travel, they can hold the phone flat in their hand with the top edge facing the direction they want to go and then use the buttons at the bottom of the screen to locate nearby landmarks and navigate. Microsoft Soundscape can be downloaded here. 2017 brought some exciting developments in the telehealth space. 2016’s 21st Century Cures Act has helped to streamline regulations around the adoption of digital health technologies, and in response the FDA has established a new digital health unit to focus on areas such as telemedicine, mobile apps, wearable devices, clinical algorithms (aka software-as-a-medical-device), and health information technology. These changes help to reduce the time and cost of market entry for companies in the digital health space, also allowing existing players to leverage their consumer wellness products into the medical field. This means that the data generated by wearable devices will be increasingly used for medical purposes, and other technologies—such as the smart home and smart speakers—may also be able to pull double duty in both the consumer and medical space. Adoption of telehealth solutions by payers, providers, and consumers is also likely to be accelerated due to the FDA’s digital health initiatives. Looking to upgrade to a connected lock? Here’s what you should know before you take the plunge. The thing that makes smart locks so popular among homeowners not because they look futuristic and cool, but rather for the simple fact that smart locks try to find the balance between convenience and efficiency. Smart locks are often used on rental properties to give tenants and landlords peace of mind. 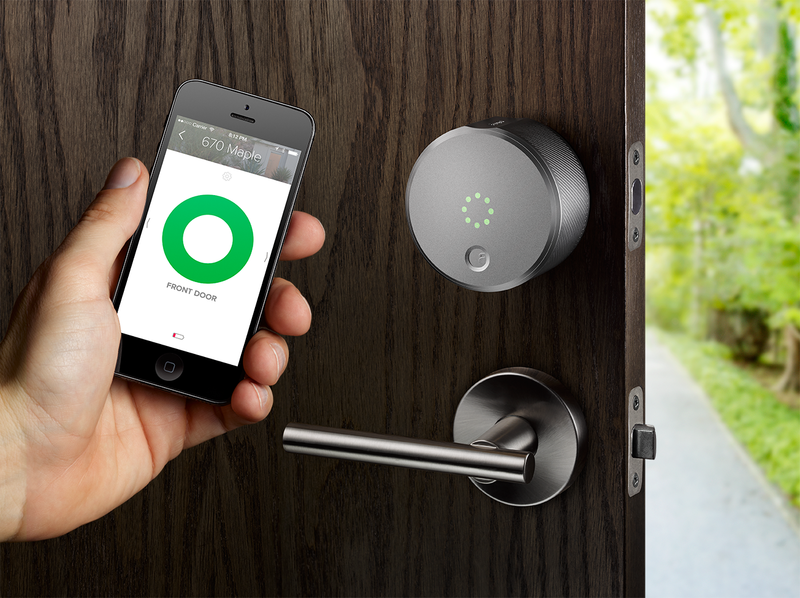 The smart lock industry wanted to make a basic action and make it even more convenient. However, some might say that the pursuit of convenience has made security an afterthought. How do you know that the smart locks installed in your home are actually protecting it? In an attempt to help you answer this question, let’s talk about some of the highest rated smart locks on the market, and see how secure they really are. The August Smart Lock is one of the best smart locks that has emerged from the smart lock industry. The August Smart Lock has a circular design, that almost makes it look like a stylized hockey puck. This cool design makes it look like something out of a modern sci-fi movie. The August Smart lock is also loaded with features that help you keep your home and property secured. 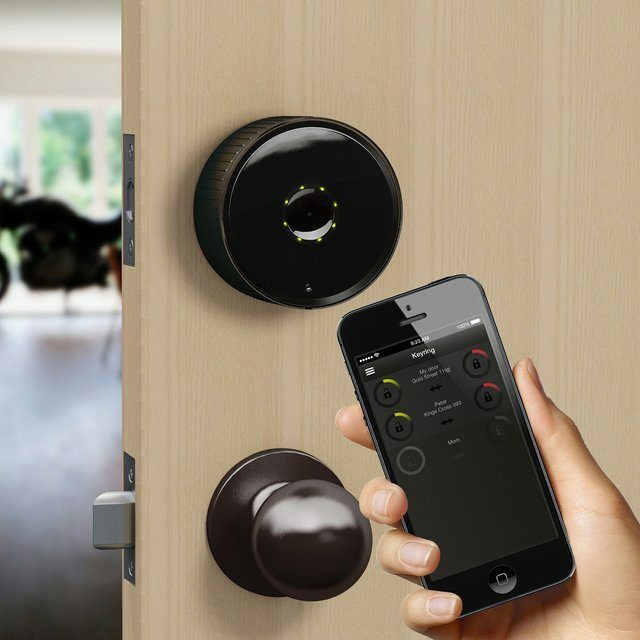 This smart lock allows homeowners to control their locks by using their smartphones. This means you will no longer have to rely on your old keys. The benefit of this is that homeowners will never have to worry about being llocked out of the house. In addition to this, this smart lock is built to work with the current deadbolt that you have installed in your home. From a physical security standpoint, the August Smart Lock is as secure as the deadbolt that it installed on to. This means that if you have a good, secure, deadbolt installed in your home, the August Smart lock builds off the security you already have. However, there are some inherent flaws in the smart lock that make it less secure than one would think. Smart locks work with software, which means that some of the issues plaguing the August are hard to see just by looking at it. These issues raised several red flags about the remote hacking of the August Smart Lock. Although many other smart locks focus on cool, unique designs, the new generation of the August Smart Lock has built upon the flaws of other smart locks to build a truly exceptional and secure lock. Danalock is another top contender in the security industry. Similar to the August Smart Lock, this lock simply wants to help homeowners lead more simple and convenient lives. The Danalock looks very similar to the August Smart Lock because it has the same hockey puck design. Also, it lets homeowners open their lock using their smartphones. The lock is able to accomplish this by using BLE and Z-Wave features. Match the names “BLE” and “Z-Wave” with the manuals of some of electronic products around your house to see if they will be compatible. These are the software and hardware that helps your smartphone control the way your lock works. Additionally, it helps you connect your door locks to other parts of your smart home, like smart lights. Being able to connect different parts of the smart home helps homeowners do a lot of complex tasks by simply clicking one button. Similar to the August Smart Lock, Danalock can work with the lock you have on your door, or you can use the lock cylinders that come with the package. These cylinders are not high-security lock cylinders which means that there is a chance that a burglar might be able to overcome them. However, in this situation, the Danalock seems to be better than the August Smart Lock because there is no keyway on the lock. This means that a burglar won’t be able to pick your lock. The Danalock seems to be a much safer option than the August Smart Lock. On the physical side, the lock functions similarly to the August Smart Lock, so it would be false to say that it was far more secure than the August, but doing away with the keyway makes a world of difference. The Kwikset Kevo smart lock is not impenetrable, but it is one of the highest rated smart locks on the market, and for good reason. Similar to the locks discussed above, the Kevo smart lock wants to bridge the gap between smart home technology and security. The Kwikset Kevo helps you do away with your keys and rely on your smartphone to open your locks. If you do not have a smartphone there is no need to worry, because there is always the option of using a key fob to open your lock. A key fob is a device that helps you operate your lock remotely. Another great feature that the Kevo gives homeowners, is the ability to give your guests temporary keys. For example, if you know some family members are coming over for dinner, you can send them a temporary key from your smartphone, which allows them to let themselves in. However, unlike the two smart locks discussed above, The Kwikset Kevo has a much better grasp on security. First, the Kevo is an actual lock cylinder, whereas the other smart locks were controlling only your deadbolt. The secure locking mechanism in the Kevo makes it hard for burglars to break into your home. The lock is very resistant to lock picking attacks. The Kwikset Kevo most definitely has some growing to do, but it is a rather effective lock for homeowners that want to ease their homes into the age of smart locks. The Schlage Sense Smart Deadbolt is (In my opinion) the leading Smart Lock on the market in both convenience and security. The lock comes in two basic trims, either the Century trim or the Camelot trim. Each one lends itself to a particular home design, either modern or rustic. Homeowners can choose the lock that best fits their design style. 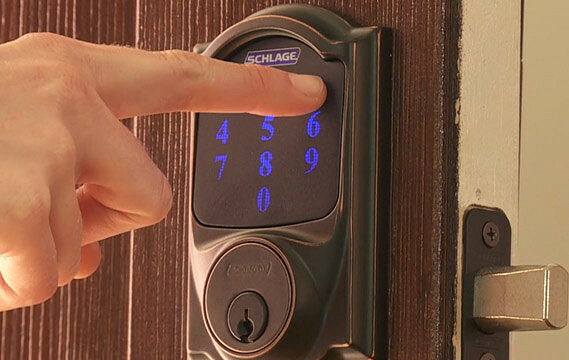 The Schlage Sense gives homeowners multiple ways to control their locks. Homeowners have the option of using their smartphones, a keypad, a traditional key, or by simply using voice commands. With so many options at their disposal, homeowners will no longer have to worry about being locked out of their homes. To make homeowners feel even more secure with their smart lock, the Schlage Sense has a built-in alarm and a high-secure deadbolt. These are the kind of features that security minded homeowners will love. This smart lock is the perfect blend of the Kwikset Kevo and the August Smart Lock, except it seems to get everything right. This is not to say that it is the perfect lock, or that it is impenetrable, but it does make it harder (than any of the locks listed above) for any unwanted guests to make their way into your home or office. The smart lock industry obviously still has lots of room to grow, but homeowners can rest assured that these locks are on the right track. Smart home technology makes your life a lot more convenient. If you are using the smart locks discussed above, you will not have to worry about your security either, because they have it covered. Ralph Goodman is a security expert and lead writer for the Lock Blog, the #1 locksmith blog on the Internet. The Lock Blog is a great resource to learn about locks, safety and security. They offer tips, advice and how-to’s for consumers, homeowners, locksmiths, and security professionals. Ralph has been featured widely throughout the web on sites such as Business Insider, Zillow, Bluetooth, Apartments.com, CIO and Safewise. Outdated technology and unreliable hardware have made some traditional home security setups tough to live with, especially for older adults. Inconvenient wall-mounted control panels can be difficult to access in a hurry if you have limited mobility, and many old-style systems feature small controls and clumsy interfaces that can be especially frustrating for arthritic hands. Thankfully, the recent wave of smart home innovations (including those from your local cable company) has brought many new products and technologies to the marketplace that make it easier than ever to secure your home. Here are some of the best upgrades to make your home safer, and an all-around better place to live. Home security starts at the front porch, and one of the best smart gadgets on the market is a simple upgrade to a common household feature: the doorbell. Products like the Skybell WiFi Video Doorbell and the August Doorbell Camera can provide an excellent first line of defense to your home that is surprisingly easy to use and install. Simply remove the old doorbell button, attach a few small wires and connect the unit to your home’s Wi-Fi. This simple 10-minute project will provide you with a motion-detecting video feed of visitors and deliveries, all visible via a mobile app on your phone. With this system in place, seniors can easily screen visitors without ever having to make their way to the door — which means being able to dismiss solicitors through smartphonesion, smart phone or tablet, without even getting up. Upgrading your garage door opener is probably the last thing you think of when you contemplate home security, but seniors may find today’s smart garage sensors to be a huge help in keeping their homes safe. Systems like MyQ from Chamberlain and other similar products connect a few simple sensors in the garage to a smart home hub, giving users wireless control over their garage doors from inside their home, or even from afar. The app makes it simple to close a forgotten open door while you’re lying in bed or away visiting family. Many cases of theft are due to something as simple a homeowner leaving a garage door open overnight, and this simple tool can help prevent that from happening. Older adults looking for more traditional ways of securing their homes may be happy to learn that the clunky security products of the past have been replaced with smarter, more reliable solutions that are much easier to install. Visit your local hardware store or talk to your internet service provider or cable company, and you’ll discover some excellent home security kits that operate with battery-powered sensors instead of wires. You can place these cameras and sensors throughout your home in a matter of minutes, or have the installation done for you by a professional. Use the products in conjunction with a wireless wall panel, or even as part of an all-inclusive smart home hub that you can control through a mobile app on your phone. These systems are effective on their own, but they’re especially useful when you throw a few indoor and outdoor smart cameras into the mix. Outdoor cameras can give you an early alert to unexpected visitors (whether you’re at home or away), and indoor cameras can provide a valuable safety net of additional security and comfort, as many include temperature and air quality sensors, too. Ninety percent of adults over the age of 65 report that they would prefer to stay in their current residence as they age. Livability can be optimized through the incorporation of universal design principles. One-third of American households are home to one or more residents 60 years of age or older. Cheerful senior couple making faces and having fun while taking a selfie with smart phone. Technology can be an enabler for aging in place. There are four categories of technology that may help seniors stay in their home longer: Communication and Engagement, Health and Wellness, Learning and Contribution, and Safety and Security. Emerging sensor and connectivity technology has made possible the development of a new generation of monitoring systems that don’t require the person being monitored (the resident) to wear a device. Instead, networks of sensors within the home connect to a cloud-based algorithm that learns the daily living patterns of the resident. The algorithm recognizes if there is a deviation that may require sending an alert to a smart phone or social media app so someone can take action, or at least pay closer attention. As you can see, all of these depend on either motion or an electric appliance or source being utilized, which pretty much encapsulates everyone’s home life. Surely anything that can reduce the astronomical number of human caregivers that would be needed over the next few decades to care for the exploding elderly demographic is welcome. Learning, embracing and adopting a new technology is, for some seniors, an extremely daunting task. But logging onto Facebook, Skype, FaceTime, Google Hangouts or perusing the internet can provide seniors with worthwhile health benefits. Many studies including a study published in the issue of Cancer Epidemiology, Biomarkers & Prevention, seniors who routinely use online technology engage in more cancer-preventive behaviors than their peers. The study shows that aging adults who utilize the internet are more likely to be active and physically fit, eat a well-balanced diet, and are less likely to smoke than their peers who utilize the internet less often. These findings led the team to conclude that increased utilization of modern technology directly correlates to seniors? overall health. To reach this conclusion, researchers from University College London examined data from the English Longitudinal Study on Aging, which collected participant information every two years for nearly a decade. Approximately 6,000 subjects age 50 and older participated. Each participant was asked to detail his or her habits for a host of daily activities which included smoking, physical activity, health checkups, routine screenings and internet usage. The results led researchers to theorize that internet aficionados are more aware of their health. 73% of Internet-savvy seniors stated they had received preventive screenings for both color and breast cancer compared to 51% of non-internet users. The study also showed that senior internet users are 50% more active and less likely to smoke. Age, ethnicity, education and socioeconomic status also played into these findings, revealing a potential inequality to cancer outcomes among those who shun this technology. While the notion that embracing technology might have the ability to improve health status, further study on this potential correlation is warranted. At Smaart House, we understand the importance of utilizing new technologies and what it can do to benefit the health of a loved one. We make technology easy to adapt and understand and provide the support seniors need to age in their own homes.